Enjoy the perfect end to your day in paradise on this 2 hour narrated cruise to watch the sunset... and maybe even catch a glimpse of the green flash. 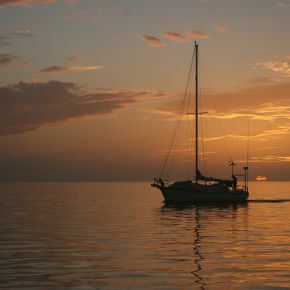 Our sunset cruise takes you through one of the Key's most prestigious neighborhoods and into the Florida Bay to see the sun as it sets on the water. Beer, wine, and non­-alcoholic beverages included. $60 for adults and $40 for kids. Reservations are required. Please call for the exact time. Times Vary, please contact Cheeca Watersports at extension 4451 for reservations and or visit our weekly activity schedule.